Longans are sometimes called “Dragons Eyes” because when the peel is removed, you can see the dark seed through the translucent flesh of the fruit and it gives the appearance of an eyeball. 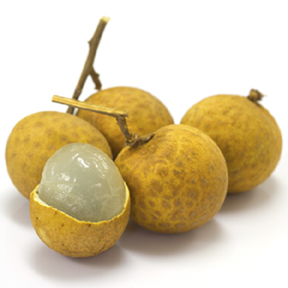 This fruit is related to the lychee, and is similar in that it grows on trees in bunches, is round, and is grape like in texture. But the flavor is different, longans have a drier sweetness. Handling: Longans are much eaten fresh, out-of-hand, but it’s also often used in soups, desserts, sweet & sour foods either fresh or dried.